When people talk about college visits, it’s usually to give advice about questions to ask and places to visit while you’re on campus. There’s also the issue of how much importance to place on the official campus tour and student guide. No one stops to ask what “kind” of college visit is intended. Yes, there are different kind of visits. There are actually three different types of visits. The first type of visit is to help figure out type of colleges the student is interested in. The second is to decide which colleges to apply to and the third is to decide which college to accept. Depending on the visit, students and families should prepare differently and ask different questions. They think a visit is just about learning the institution. They don’t think about visits as part of a process to further define their own preferences. I’ve seen comments where students say that they aren’t going to read anything about the school beforehand because they don’t want to have any preconceived notions before they visit the college. Really? These teens have so much free time that they can afford to go on a campus visit without knowing if it offers majors they’re interested in, is even on the radar for affordability, or if interviews are required or recommended? 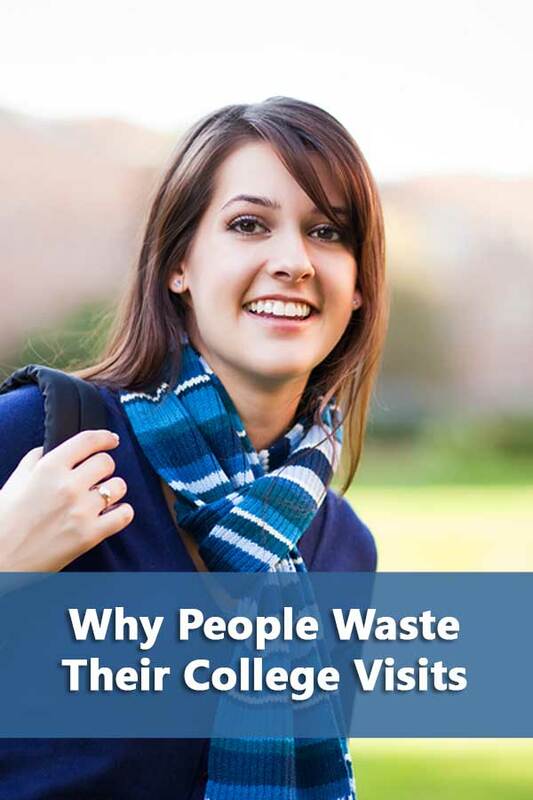 While this attitude may be acceptable for the first category of campus visits, it’s also the type of visit that most students don’t do because they don’t begin soon enough. Think of campus visits and finding a college like buying a house, it shouldn’t be too hard given that they’re probably in the same price range. Consider the following two approaches. If you live in an area and aren’t in hurry, you can take your time and start by visiting open houses to get an idea of neighborhoods and the type of features you like in a house. When you’re ready to get serious, you can get a realtor and give her the specifics you’re looking for you and really start comparing houses. But if you live some distance away and you’re preparing for a move to start a new job, you may only have a week or so to find a house to buy. You are under a deadline with limited time to spend figuring out what you like. Wouldn’t you put in some effort before the visit to make sure that you use your time as effectively as possible? College visits tend to be like the latter approach because families face specific application deadlines with limited opportunities to make campus visits. College visits can be more like the former if families start the process early enough. But there is still always going to be the problem of limited access to campuses far away. A few things to keep in mind when doing these visits. Small schools will probably be much more accommodating to special requests than large universities. After all, if an admissions office is organizing tours for dozens of students on a daily basis, it probably isn’t going to spend time creating custom schedules for each potential student. How much the parents are involved will depend on the student. The parent might identify and track available college visit days and requirements but ultimately, the student should be the one filling out visit forms, requesting interviews, and writing thank you notes. Visiting a campus during the school year with classes in session is ideal but summer visits provide a lot more flexibility. Even without classes in session, you can learn a lot on a college visit. How Important are Campus Tours? There’s also the standard advice not to judge a campus harshly based just on the actions of the tour guide. Funny, no one ever warns you about being too positive about a school based just on a tour guide. Anyway, given how much a school has to offer, eliminating it from your list based solely on your tour experience is probably not a good idea. The department of your dreams will have little to do with the admissions office policy and decisions. However, I think that there are things that you can pick up from a standard tour/information session that can tell you something significant about the college. For example, we visited a well-known Liberal Arts College with an equally, if not more so, well-known reputation for underage drinking. When asked about underage drinking during the general presentation, the admissions director responded that it’s illegal and not allowed. It really wasn’t more than a one sentence response. When someone else asked a similar question designed to get at the same issue, the response was word-for-word the same. Now I can’t tell you if the take away from that experience should be that the college has a drinking problem and isn’t dealing with it or that maybe they are dealing with it but it’s none of the parent’s business–you know, the ones who will be paying $60,000 a year in tuition. Either way, there’s a problem there. The more college visits you make, the more you’ll start to pick up on certain elements that are important to you. College Visit Type: What Kind of College Do You Like? This step is generally skipped or sort of, kind of merged in with the next step. The fact is that most people don’t start the college search early enough to allow for this sort of generic visit. Yet, it is the easiest to do and probably the most important in expanding your potential college list. Because students shouldn’t be focusing on unique colleges at this point, they can visit any nearby colleges to start to get a feel for general differences. Big or small, rural or urban, the quality of the dorms, recreation availability, that sort of thing. You don’t have to worry about meeting the requirements to attend a specific college’s “open house” event, you can go to whichever one is convenient. Basic campus tours generally have no requirements, just show up at a set time. Ideally you would do these visits no later than the fall of your junior year. I know most parents are thinking, “right, as if I could get my teen to start doing anything about choosing a college.” That’s the beauty of these visits, they really don’t require your teen to approve the choices. They don’t matter at this point. You just have to get them in the car. And out, based on some parents’ experiences. If nothing else, these type of visits should help the parents start building a frame of reference that they can use to assist their teens when they start to care about the visits. Do more than just pay attention to campus security. Seriously, that seemed to be the only question parents were asking on a lot of our campus tours. One of the things I learned about and started paying attention was January terms. During the one month January term students were able to immerse in just one subject on or off campus. They are also used for career development. I found them incredibly appealing, my son not so much. It was during these first college visits I heard about Foreign Languages Across the Curriculum. To encourage foreign language development, certain “regular classes” history, math, etc, were taught in a foreign language. Again, I thought it was a great concept. Again, my son, not so much. Remember, at this point the goal is to visit as many “kinds” of campuses to start learning about the differences. Be open to possibilities rather than eliminating a school because of “negatives” such as size, location, type, etc.